Pest animals can have negative impacts on resources, natural environments, wildlife and commercial crops. All of New Zealand’s pest animals were brought here from overseas, either by accident or on purpose, and many have flourished in the absence of their natural predators. How can we help you with your pest animals? Help with identifying unknown pests. Advice on animal control methods. Dama wallabies were released near Lake Ōkāreka in 1912 and have now become well established in some Rotorua forests. It's hard to believe such a cute, shy animal could be a problem but they have a huge appetite for grass, seedlings and shrubs. They're nocturnal and cautious so they're very hard to find and catch. 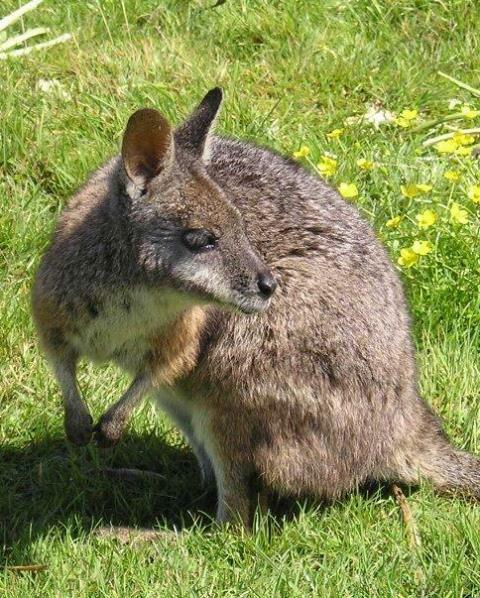 Please report wallaby sightings on our online app here . Game birds, like ducks, could be causing a problem on your property. Hunting game birds outside of the shooting season is strictly prohibited. If you need help to control game birds on your property outside the shooting season, contact Fish & Game New Zealand for advice. Fish & Game New Zealand is the organisation that manages game birds such as the pūkeko. Pūkeko may be hunted (you must have a licence) within the limitations of the licenced shooting season for your region. Hunting pūkeko outside of the shooting season is strictly prohibited. If you need help to control pūkeko on your property outside the shooting season, contact Fish & Game New Zealand for advice. The Regional Pest Management Plan for the Bay of Plenty defines feral or wild cats as “Any cat that is living without direct or indirect (sheltering under buildings, scavenging food) assistance from humans”. We will provide advice and support where feral cat control is part of the an integrated pest control programme (e.g. through Biodiversity Management Plans). Contact your local Land Management Officer to find out more about these programmes. Control varies depending on which type of wasp is present. To help identify which wasp you have, check out our wasp fact sheet (below). Cautiously check for nests and keep people away from any that you find. If the nest is at ground level or in a garden bank, it is most likely a German wasp or common wasp nest. If the nest is attached to a wooden fence or cladding, or found under decking, it is most likely a paper wasp nest. Ask your neighbours to check their property for wasp nests at the same time. If they find any, ask them to deal with the wasps straight away. If the wasp nest is on City or District council land, contact the relevant council office and ask for the nest to be controlled as soon as possible. Be sure to provide accurate details of exactly where the nest is when you lodge a Service Request. For your safety, we recommend hiring a local professional pest controller to get rid of the nests (look for pest controllers listed in your local Yellow Pages). Alternatively, wasp control products are available at hardware stores, garden centres and supermarkets. Thoroughly spray paper wasp nests with a long blast of aerosol fly spray. This is best done in the evening, when the nest is full. After spraying the nest, be sure to step quickly out of the way as the wasps will drop to the ground and take several minutes to die. They will still sting during this time. Approach the swarm with caution. Check that they are honey bees, which are ORANGE and black, and not wasps, which are YELLOW and black. Don’t panic. Swarming bees are not usually aggressive and will usually fly away in a day or two. If they are not causing a nuisance, leave them to move on their own. Contact a local beekeeper. They can try to collect the swarm for you, locate beekeepers in your area (see below). How big it is – soccer ball size? Where it is – on a fence, up a tree etc.? If the bee swarm is within 5 kilometres of the Port of Tauranga; although unlikely, foreign bees can arrive in shipping containers and may escape, potentially introducing new pests and diseases to New Zealand. For bee swarms close to the Port, please notify MPI on 0800 008333. Argentine ants are a nuisance pest worldwide, known for swarming over exposed food, getting into screw-top jars and making outdoor activities unpleasant by crawling over people. Argentine ants have become well established in the Bay of Plenty. Common ant sprays and baits are often ineffective at controlling them, and can cause the nests to split and make your infestation worse.